Venerable: commanding respect because of great age or impressive dignity; worthy of veneration or reverence because of noble character; a title for someone proclaimed by the Roman Catholic church to have attained the first degree of sanctity. The Anglo-Saxon monk Bede easily met this definition. What little we know about Bede himself comes from his own writings. We know he was born c. 673 and due to his connections may have been from a fairly wealthy family. He says he was born in the lands of the monastery where he spent most of his life, in the Kingdom of Bernicia. At the age of seven, he was placed in the monastery of Wearmouth in Northumbria under its founder Benedict Biscop. He later was at the twin monastery of Wearmouth, named Jarrow, under the supervision of Abbot Ceolfrith. There is record of a plague in 686 that killed all the monks except Ceolfrith and a young lad in his care. This young lad may have been Bede. He refers to himself as being of the gens Anglorum (English nation) and was proud to be a Christian. He says he was ordained a deacon at the age of nineteen and as a priest at the age of thirty. Bede was a pupil of Benedict Biscop, Abbot Ceolfrith and Sigfred, another abbot of Wearmouth. The thing he loved most was learning the Scriptures. He would certainly have learned Latin at an early age. He later learned Greek and had some exposure to Hebrew. He was also instructed in chronological studies, secular literature, poetic arts, the zodiac, chanting, mathematics, astronomy and ecclesiastical computation. The twin monasteries of Wearmouth and Jarrow had an amazing library. Benedict Biscop traveled all over the world and brought home books. Abbot Ceolfrith is said to have doubled the size of the library. Bede would have had access to books of other monasteries such as Canterbury, Hexham and York. There were many editions of bibles and commentary on gospels and scriptures. He mentions grammatical works, histories, chronicles and books on monastic affairs. Bede was the first to name Augustine, Ambrose, Jerome and Gregory as the four great Fathers of the Church. We know from others that he loved to sing. As the monastery of Jarrow recovered from the plague of 686, Bede would have gained many new, younger pupils. He also corresponded with monks in other monasteries outside of Northumbria who had similar interests. There were many visitors to Jarrow whom he met and spoke with. We know he visited the monastery at Lindesfarne and also traveled to York to teach but other than that, he seems to have been content to live in his small cell at Jarrow, writing and teaching surrounded by books and parchments. 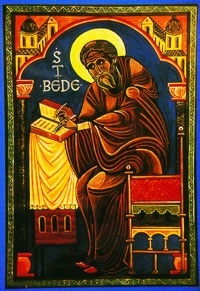 Bede was very concerned for the welfare of the English and wanted them to know how to read and write Latin to bolster their belief in Christianity. This was a daunting task. In order to make the scripture accessible to his people, he worked at translating Latin works into English such as the Apostles Creed and the Lord’s Prayer. But Bede was a very prolific writer. His writings include: Lives of Saints such as Cuthbert and Felix, a book on martryrology, didactic works and many biblical works such as commentaries and exegesis on Samuel, Genesis, Ezra, Song of Songs, Proverbs, Acts, Luke, Mark, Epistles and Revelations. He wrote homilies and poems. But perhaps his greatest work was in history. In addition to his “History of the Abbots of Wearmouth and Jarrow”, the Chronica Minora and Chronica Maiora, his ultimate labor was the “Ecclesiastical History of the English People”. This is the greatest work of history produced in the barbarian world. His concern was to report the aspect of Anglo-Saxon life related to the conversion of the people to Christianity. This was not a mythical account but is based on the facts that were available to Bede at the time and gives an astonishing amount of information about Anglo-Saxon England that has been backed up by other evidence. He was to finish the “Ecclesiastical History” in 731. His last known work was to be the letter he sent to Bishop Egbert of York although we know from other accounts he was working on a translation of the Gospel of John from Latin to English. We have a full account of Bede’s death on May 26, 732 at the age of fifty-nine written by his pupil Cuthbert who was to become abbot of Jarrow fifteen years later. Cuthbert describes Bede as a saint and tells us Bede continued to teach and sing through his final illness. He was buried at the monastery at Jarrow where he lived most of his life. There is an unsubstantiated miracle attributed to Bede. Alcuin of York wrote a poem “The Saints of the Church of York” where he describes a miraculous act of healing. He says a sick man was surrounded by the relics of Bede and was completely cured. There was to be no evidence of a cult to Bede in England from the 8th to the 10th Century but others revered him on the continent. Saint Boniface, during his missionary work, sent letters to England requesting copies of Bede’s work. Alcuin, who was a teacher at the school at York which was set up by Bede’s pupil, Egbert, was instrumental in disseminating Bede’s works to his friends. 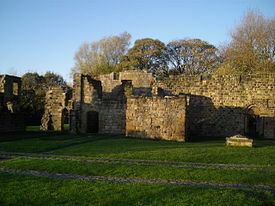 During a revival of monasticism in the 10th Century, the cult of Bede grew. 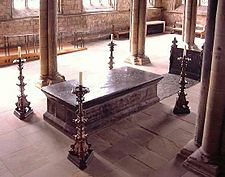 There is a story, possibly true or maybe not, that Bede’s bones were stolen from Jarrow and taken to Durham where they were placed in the same tomb as Saint Cuthbert. The bones were moved a few times before 1831, when they were placed in the tomb where they lay now. There were two ecclesiastical councils held in Aix, France in 816 and 836 where Bede was named in a group who were called “venerable”. By the 11th and 12th Centuries, it was commonplace to call him “Venerable Bede”. Bede’s scholarship and importance as a Christian thinker were recognized on November 13, 1899 when Pope Leo XIII named Bede a Doctor of the Universal Church. He is the first and only Englishman to be named doctor ecclesiae. Reblogged this on The Maze. This is so much interesting!!!!! I have heard of the Venerable Bede, but never knew anything about his life. Thanks 🙂 Good post. I think I could have been friends with Bede. Such intelligence and scholarship. I find him fascinating. We owe such much to the venerable teacher. Ora pro nobis.